UFO sightings and alien interest in both earthquakes and nuclear plants have been documented for years. This publication has reported extensively on the intense, if not unprecedented , UFO activity in Japan before, during and after both the earthquake and the tsunami. So it comes as no surprise that a number of UFO sightings as well as film evidence of alien activity around the damaged Fukushima Nuclear Plant have come to light. The footage below is remarkable, even in relation to some of the other astonishing footage that has come out of the region recently. The clip comes from a news report by German media group NDR. 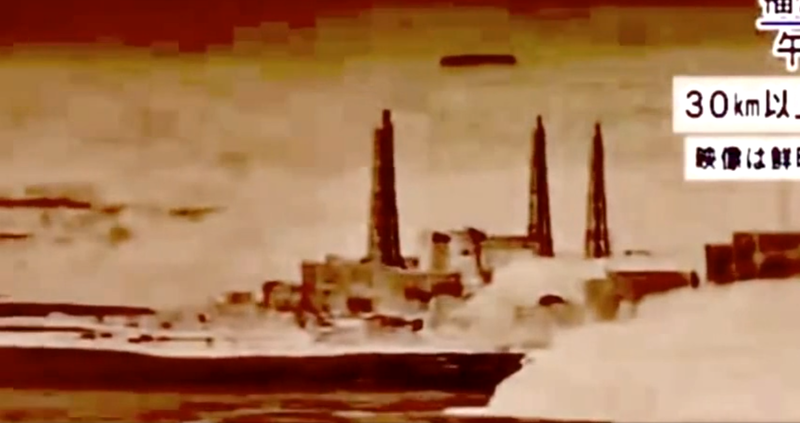 At 55 seconds into the clip a giant UFO can be seen hovering above the nuclear plant. Obviously this was a slip up on behalf of NDR and the Asian news outlet the group received the footage from.